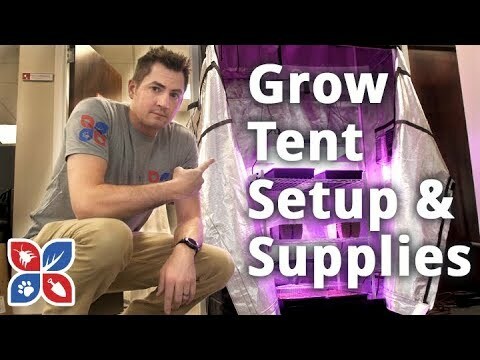 Paul goes over how to setup a grow tent for gardening indoors, talk about the cell flats for seeds, touch on the grow light setup we are using and a few other tips you should keep in mind when setting up your indoor grow tent. Rained all night last night making everything muddy and gross... misting a little right now with a lot of overhead clouds and a chance of thunderstorms later in the day, so I guess it's time to set up a grow tent. Sooo.. it didn't take me a full day to put the tent together, but time got away from me and I had some other things I had to tend to.. but it's the next day, it's done: lets go over it. If you remember in the last video, I went over everything that's going in our raised garden beds. We were gonna start them off, from seed, inside of a grow tent. 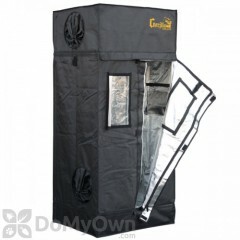 What we have is a 2 foot by 4 foot by 8 foot tall indoor grow tent. and the reason we are using this particular setup: this really is the best place we could put our tent inside the office here and as you can see, we have a whole lot of light we have to contend with, and obviously, it's temperature controlled in here. So we needed to control two main things: Light and Temperature. And this tent is perfect to control those two things. Let me come to just show it off to ya. We can seal off a lot of the sides or the vents here... up there and down here on the side. And it zips up all the way around the bottom, up the middle here, around the top, and the extension part up there. Let's show off the inside to you... it's got the flaps that cover the zippers so it really seals it off nicely. And as you can see it's insulated really well so we can control our heat sources inside of the tent while we have our seedlings growing in our trays underneath our grow light. And as you can see right down here is where we have our power cords coming in to power our lights and our heating mats that go underneath our trays. And what's awesome about it again, is where those cords come in, we can cinch that off so we don't have any light or outside air or heat spilling into our tent. And again we can really control that light and heat source. If you want to know more about this tent, I'll leave a link in the description box below or you can hit the "i" icon at the top of the screen. So let's go ahead and talk about some of the other pieces of equipment or other items that you're gonna need if you're starting seeds indoors. The first up -- Let's talk about containers... and there are literally about a dozen different ways that you can go about doing this. Let's touch on a couple of them. Now the best thing to do here is use divided containers with a single seedling per container rather than filling a large container with potting mix and many different seeds. Now the main reason you don't want to put a bunch of seedlings in one container is those seedlings, the roots will eventually grow into each other and likely be injured later on during transplanting. Most of the time, these plastic sheets with these small containers you will hear them referred to as cell flats. And they fit into standard solid trays. And you can also use small individual plastic pots... just whatever way you decide to go, you'll want to make sure that all the seeds stored in containers have some sort of drainage holes at the bottom. If you don't want to go the plastic route, you can use fiber pots. Now these fiber pots, they're made from organic materials such as peet, cow mature, or shredded wood and some gardeners even make pots from strips of newspaper. These fiber or paper pots that break down in the soil are particularly good for raising seedlings that don't transplant well such as cucumbers and squash. Now a great thing about a lot of these containers is they include a clear plastic dome that fits over the tray of your plants. And what these domes are really good at doing is allowing light in, but help keeping moisture from escaping. They can also help you retain heat provided to the root zone. Now note obviously these domes have to removed once those seedlings are tall enough to where they can touch them. We're gonna start with one of the plastic trays with a clear dome and organic pots. And the reason I'm gonna start with these organic pots, if our seedlings start to outgrow them, we can simply just break those pots apart, take the seedling out, and transplant them to a bigger organic pot. I just feel like if we use one of these plastic trays with the plastic pots, it might be a little harder to get those seedlings out of them if they start to outgrow them, whereas again the organic ones I can simply tear these apart and transplant them easier. So that covers our containers: let's move on and discuss the next item that we're gonna need and that's light. 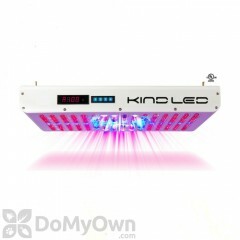 Now it's better to grow them under an artificial light than rely solely on natural light. Now there are brands of lights that are sold as grow lights, like the one we're using inside our grow tent and yeah... it totally looks like something from "Close Encounters of the Third Kind" These type of lights are designed to provide a specific light range required by certain plants, but if you don't want to go this route, if you just wanna keep it simple: standard fixtures with two cool white flourescent tubes per fixture also give plants adequate light and are pretty inexpensive. With light sources, you want to make sure you are keeping them as close to your plants as possible. So as they grow up, move the light up with them. Two inches is kind of ideal, but you want to make sure to keep the lights no more than four inches above the tops of your seedlings. Another problem that I've come across that a lot of people have a tendency to do is leaving lights on continuously... Don't do that. Plants are gonna need about 12 to 16 hours of light daily with some dark periods in between all of that to develop properly. If you can, I would develop some kind of simple timer to be part of your setup, or just really keep track of how long your lights are on. The next item on our list to make sure our seedlings have success is providing them with a consistent heat source. And that's gonna come from a heating mat. Something you've got to know about temperatures within the potting mix of indoor containers: they can be as much as 5 degrees lower than indoor air temperatures. 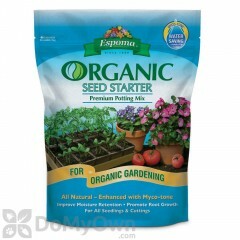 If you're starting seeds indoors, they can germinate sooner and produce healthier roots when that potting mix is warm. If you have a bottom heat source, you can also prevent dampening off. and what that is the death of tiny seedlings due to pathogens at the surface of the potting mix. So by having one of these electric heating mats, that's gonna provide those seedlings that consistent heat that they would prefer. Just make sure if you use a timer for lights above the seedlings, that you don't plug the heat mats into it. The next item on our list and I would say probably the most crucial: soil. Now most commercial seed starting mixes are gonna contain vermiculite and peat and no actual real soil. 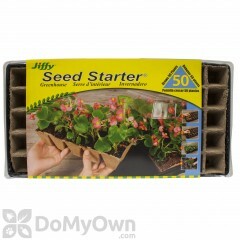 These are gonna be best for starting seeds indoors. They're gonna be sterile, they're gonna be lightweight, and they're gonna be free from any type of weed seeds that you might have if you had soil in the mix. Of course it's all gonna depend on what type of vegetables or plants that you're trying to grow within your garden. the soil mix that we're gonna use to kick off our seedlings contains peat, hummus, peat moss, and pearlite. And lastly, you want to make sure you have a water source. Something like this will be just fine. More on this... later. These are fun. So those are the basic things that you're gonna need if you're starting seeds indoors inside of a grow tent. If you have any other further questions on anything I touched on in this video, leave those in the comments section below, email the Customer Service staff, or pick up the phone and give us a call. And if you're not already subscribed to the channel you can do so by clicking this button right here, you can click this playlist to see all the videos in the Do My Own Gardening Series... and click this playlist to see all the videos in the Do My Own Lawn Care. And... As always, thanks for watching!